Technical Committee for Standardization №82 «Welding and allied processes" operates under the Kazakhstan Welding Association. Kazakhstan Welding Association «KazWeld» was created due to the initiative of the French oil company Total. This initiative was supported by the President Nursultan Nazarbayev and the Government of the Republic of Kazakhstan. The project was entrusted to the Ministry of Education and Science and the Ministry of Oil and Gas (currently the Ministry of Energy). 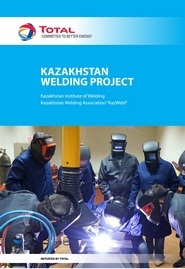 On May 19, 2015 at the General Assembly of European Federation of Welding (EWF) in Bergen (Norway), Kazakhstan Welding Association "KazWeld" got the full authorization for the certification of welders, welding operators and brazers according to EWF scheme with the issuance of certificates according to EN 287, ISO 9606, ASME BPV Section IX, AWS D 1.1, EN 1418, EN 13133, EN 13067 and others. 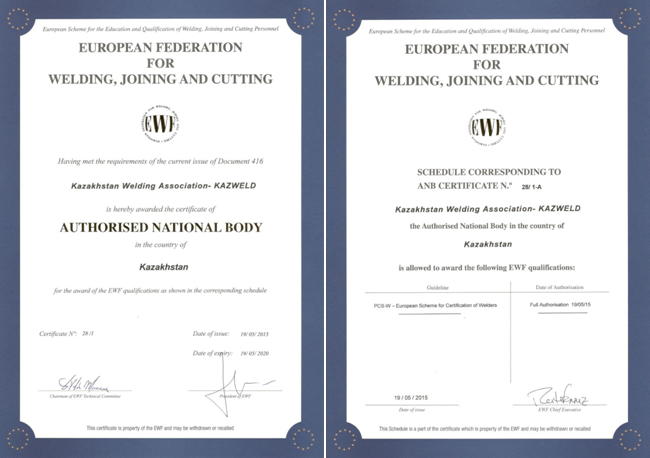 Thus, KazWeld became the 1st Authorized National Body (ANB) in the world, which will apply the EWF Welder Certification Scheme according to international, European standards and standards of foreign countries. None of the ANBs in Europe and in the world has received such a right yet, despite the fact that the scheme had been designed in Europe for the certification of welders, welding operators and brazers in each IIW member country, acting on behalf of EWF. 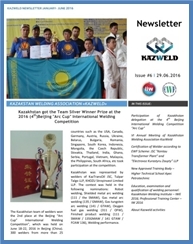 Certificates issued by Kazakhstan Welding Association “KazWeld” will be recognized in all EWF and IIW member countries. EWF consists of 32 member countries and IIW - 57 member countries. FYI: Kazakhstan Welding Association “KazWeld” became an observer country of European Welding Federation on November 18, 2014. 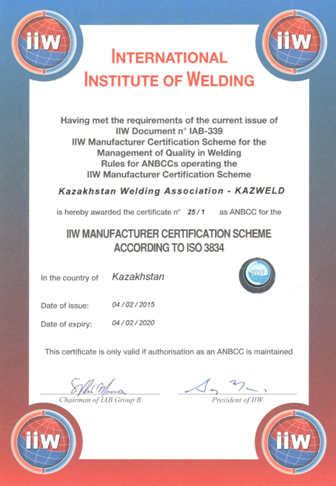 IIW Manufacturer Certification Scheme according to ISO 3834 "Quality requirements for fusion welding of metallic materials"
On February 4, 2015 at the IIW & IAB meetings in Paris (France) the Kazakhstan Welding Association “KazWeld” got the full authorization to apply IIW Manufacturer Certification Scheme complying with ISO 3834 "Quality requirements for fusion welding of metallic materials». 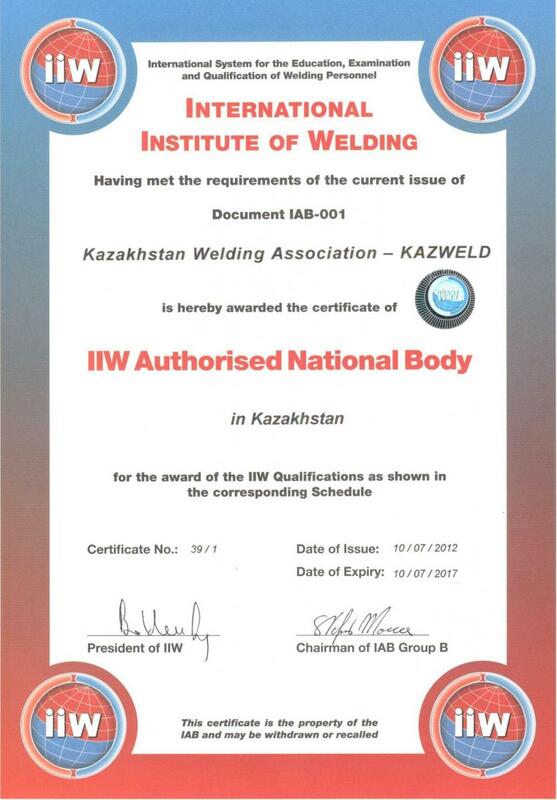 This right was received after the International Authorization Board (IAB) of International Institute of Welding (IIW) gave the preliminary authorization to KazWeld in November 2014 as well as training of local lead assessors, assessors and technical experts. The competence of the Kazakhstani specialists had been confirmed by the IIW leading experts based on the results of the successful audit that was held in one of the leading companies in Kazakhstan. In this regard, Kazakhstan Welding Association has started accepting applications for company certification in accordance with ISO 3834. After a successful audit, the company will get the IIW Certificate, which ensures the high quality of welding products to consumers. IIW Certificate provides a competitive advantage as well as increases the credibility and visibility of manufacturing companies. Certification is carried out complying with ISO 14731 «Welding coordination - Tasks and responsibilities". This standard refers to IIW Qualification System as a way to demonstrate people’s technical knowledge. It is of great importance in assessing the competence of welding personnel during the manufacturer certification process according to ISO 3834 and EN 15085. Certified welding personnel is an indication that the company cares about improving the quality of not only the workers but also products, which provides the company a competitive advantage in the market. Read more ….